Like pretty much everything else in Paris, it didn’t go according to plan. We were supposed to have a day at the Louvre, but as luck would have it, that was the day the Museum was forced to close due to an employee walk out to protest pickpocketing. The Photographer and I were two of the “disappointed tourists” referenced in this article. 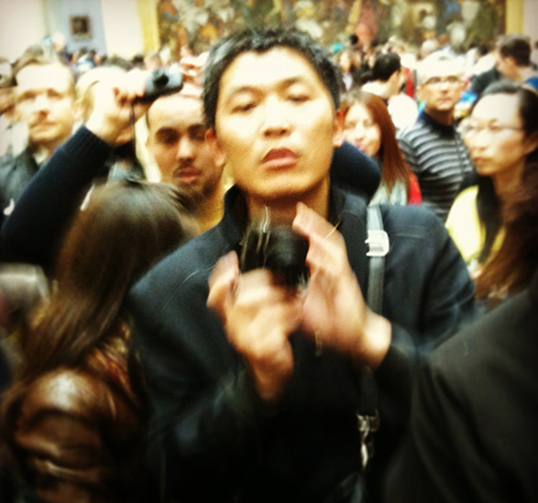 So, instead, we ended up with a few rushed hours at the Louvre a few days later. 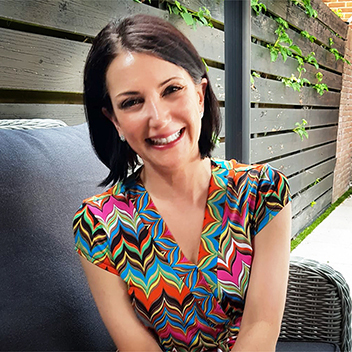 We spent most of our time in the Italian Paintings exhibit because you can’t go to the Louvre without seeing the Mona Lisa and there was so much to see on the way in and out that we lost track of time. I’d always imagined the Mona Lisa to be of average size but then I kept hearing how “small” she was, so in my mind’s eye, she had shrunk from average size of about 16″ x 24″ to something about half that size. In reality, she’s closer to my original impression, but I guess compared to the huge canvases of say, Botticelli, she is relatively small. It was cool to see the Mona Lisa in person, but the experience was pretty overrated. Due to her history with attempted vandalism, she’s behind glass, and the crowds are kept several meters away from her. This made it difficult to experience her in the same way as the other less famous, but no less spectacular paintings. It can bring tears to my eyes to stand within touching distance, admiring the brushstrokes, shadows, highlights, and colors of an unprotected and several hundred year old painting. Am I the only one who gets teary in art museums? Somewhere, there’s a 12 year old (or so) boy who will never think of the Mona Lisa again without thinking of me. Something about crowds makes people forget their manners. I waited my turn and when I finally got to the front of the crowd, I just wanted to look at her, but this little creep started pushing me, then before I knew it, he was reaching over my shoulder, and holding his camera in front of my face. So I grabbed his impolite little wrist and told him that looking at fine art means using his manners and that he would need to wait his turn. He looked like he saw a ghost, then scurried off, I assume without getting his photo. I have no remorse. My favorite work of all was the Venus de Milo. I’ve always loved her, but wanted to see her in person even more after falling in love with the spectacular sculptures in Rome. I know she’s Greek, but Rome was my first up close and personal experience with such old and amazing stonework. I’ll never forget my first glimpse of the fountains in Piazza Navona. Look at those abs! I wonder what her arms looked like. I’d love to spend more time at the Louvre at some point, I’d also like to see the Impressionist works at d’Orsay, but right now, I’m dreaming of going back to Rome. I never did get to see the Sistine Chapel. I was surprised at how small the Mona Lisa was. And – even when I went in the 1980s it was behind glass, the picture I took shows my reflection in the glass. and that boy was bratty. Good for you. I’m not sure where they are now – they were in, I think the Orangerie back when I went – but Monet’s Water Lilies took my breath away, there are many of them and they are HUGE. 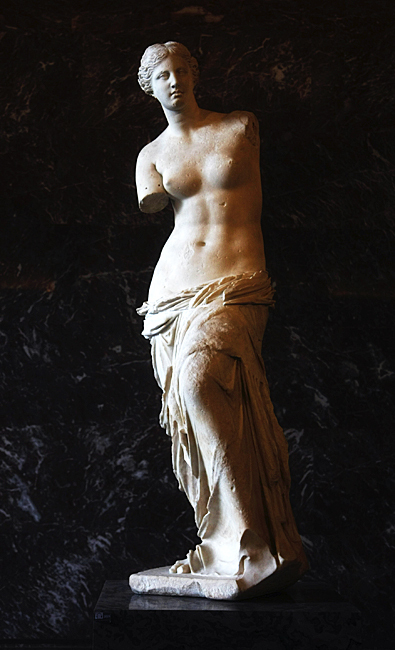 Venus de Milo was also gorgeous. I think I have a picture of that too. Did you see any of the Egyptian cats? they revered them and there were a lot of statues of them in the Egyptian section. I really want to go back! My Physical Therapist is going in July, wonder if she has room in her suitcase?? That child’s behavior is unbelievable! Barb, I wish I had the chance to see the Water Lilies, the Louvre walkout really messed up our plans because they said it was going to reopen, so we wasted a lot of time waiting around for nothing. d’Orsay has some of the Water Lilies, but I think l’Orangerie has the largest collection. The Impressionists have a way of capturing spaces I’d love to jump into like one of those Mary Poppins sidewalk paintings! I wanted to see the Egyptian collection (for the cats) but didn’t have time, also had to skip decorative arts :( I could’ve really spent a couple of days at the Louvre with no trouble whatsoever! Lisa, Maybe he’ll drop the admission price ;) I think last time I was there, it was €16, and a lot more if you wanted to book a guide and skip the queue. I hope to go back to Rome sometime in the next year, and I will see it regardless of the price. As for that kid – GOOD ON YAS! He has to learn somehow, right? If his parents won’t teach him manners, someone else in life surely will.